Multi-channel annual report - nexxar lab. 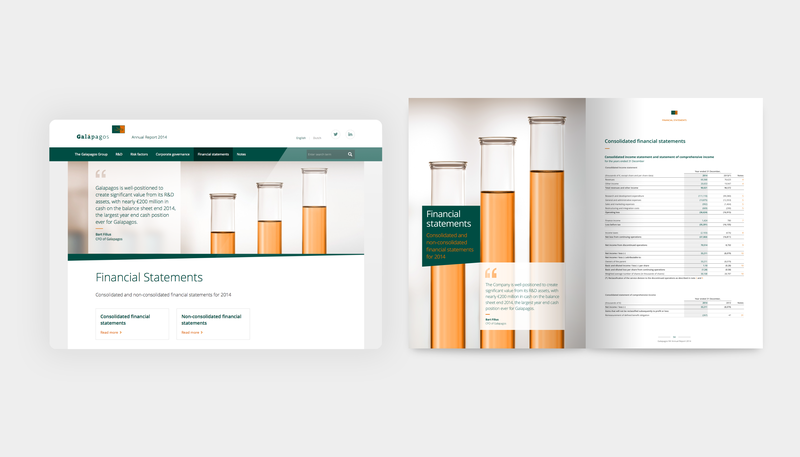 With Galapagos NV we attracted a new client for the Online First implementation of their annual report and the resulting PDF version. 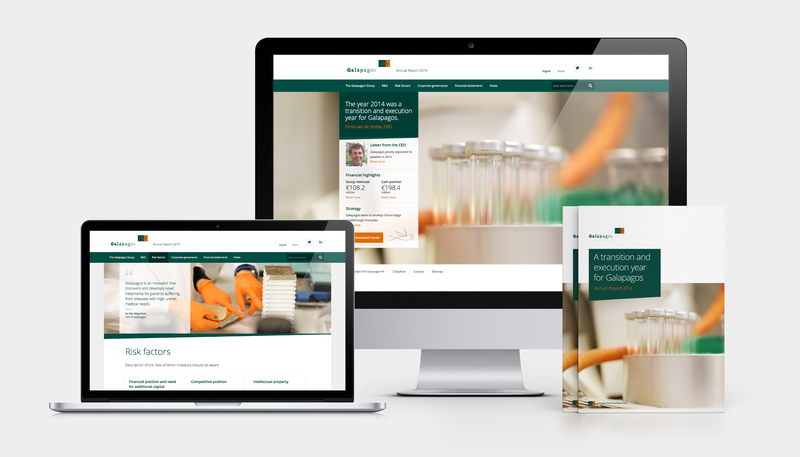 The Galapagos annual report was created following the nexxar Online First process. In this multi-channel approach, the online report, the PDF and other report formats are generated straight from our web based CMS. Instead of building an HTML report that is following a print design/concept, both channels are considered right from the beginning. The Galapagos concept lives from its large images, which were selected to fit for landscape and portrait use. We created a design that follows a consistent colour scheme and reflects the main colours of Galapagos. Additionally, we designed and used only scalable vector graphics to ensure the best possible quality when zooming in and out of the web PDF. To meet the requirements of both report formats, we have chosen a sans serif web font for the HTML report, whereas the body text in the PDF has been replaced with a serif font. However, the PDF table design keeps the sans serif web font to ensure better readability. Once the HTML report is set up and contents are implemented, the PDF is automatically generated from our CMS. Depending on the complexity of the report and the different languages, this export process is open for various possibilities to optimise the output, e.g. by improving page breaks. Even though contents are taken from the online report, all format settings such as font size, font colour, character spacing etc. can be adjusted individually for the PDF. Corporate fonts can be implemented just as well as a guided index, page headers and footers or logos. In addition, interactive elements, such as hyperlinks, can be transferred to the PDF too. We can produce double column PDFs, with or without justification, where all pages are generated from one source, our CMS. 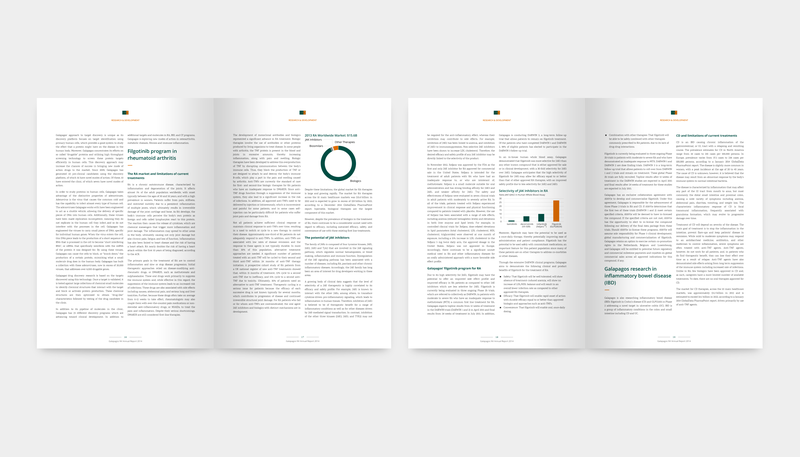 The Galapagos report combines double and single column layout, the latter for the financial and notes section. Elements that don’t fit into a two column layout, e.g. tables or big graphics, can be adapted to go across the entire page width. Generating a PDF is an automated process. Amendments only need to be carried out once (in the CMS) and the PDF can be synchronized anytime at the push of a button. No additional costs for typesetting or lithography. If desired, the PDF can be prepared as a hardcover edition. Download the Galapagos annual report as PDF. Summing up, for the Galapagos Annual Report we considered both the online and the PDF version from the very beginning. When it comes to implementing the report, we focus on the usability of the online version, yet we are also able to achieve a great PDF result.